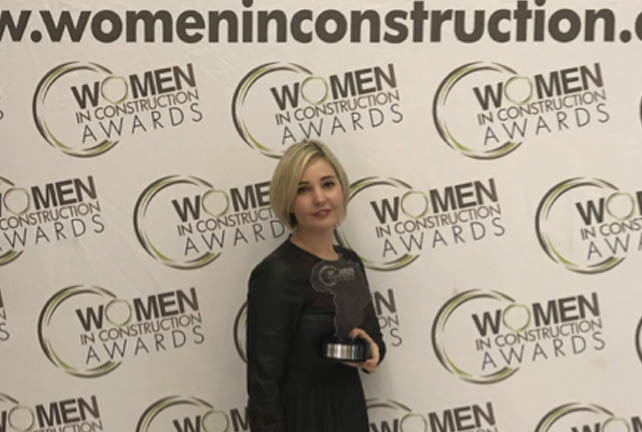 The 5th annual Women in Construction Awards Gala Dinner was hosted on 24 May 2017 co-located with the African Construction and Totally Concrete Expo at the Gallagher Convention Centre, Johannesburg, South Africa. Bianca Shakinovsky, CEO of Pentafloor, won the Young Entrepreneur/Rising Star Award (under 40 years). The Award recognises young women who are shaping the future of construction in Africa today with tremendous dedication and energy. This award provides a platform to unearth and recognise that inspirational and exciting leader of tomorrow. The exclusive Gala Dinner of just over 200 guests was a collaborative platform dedicated to recognising excellence in Africa within the construction, cement and concrete industries. The Awards categories recognise those women who are Pioneers in Innovation within the built environment as well as identifying those “Young entrepreneur/rising stars” who have put themselves out there and have been identified as the ones “to watch” as they get a foothold within their sector. The awards also acknowledge organisations that have stepped up and developed women’s roles through innovative training programmes and have demonstrated commitment to developing the careers of women in the industry. This year’s awards celebration was attended by senior-level executives, key decision-makers and suppliers, within the construction, cement and concrete industries.